For Feeding Tube Awareness Week this year I wanted to share something I wrote last year. 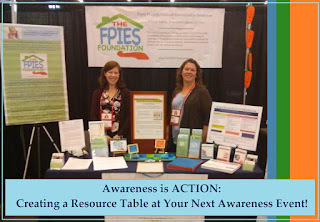 I wrote it for a fellow FPIES mom friends website, Awareness Critters, to raise awareness to both rare diagnosis and tube feeding. I want to share how much having a feeding tube has positively impacted our son’s life. Having FPIES doesn't mean he has to have a feeding tube, but he does. Having FPIES does mean that he has a delayed food allergy condition. There are no tests for this type of food allergy and the only cure is to avoid foods that trigger this delayed allergic response. Some babies/children are allergic to 1 or 2 foods, while others (like our son) can be allergic to multiple foods which can further limit the diversity of the diet. 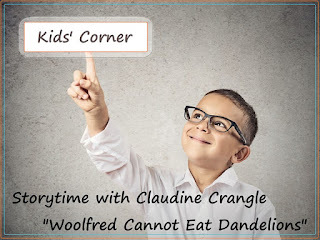 Making things more complex for him, foods like soy and corn; which our son is allergic to, are in/on so many foods (sprays and waxes on fruit, can linings, plastic materials, animal feed, preservative and additives, etc) which makes his variety of safe foods became even further limited. 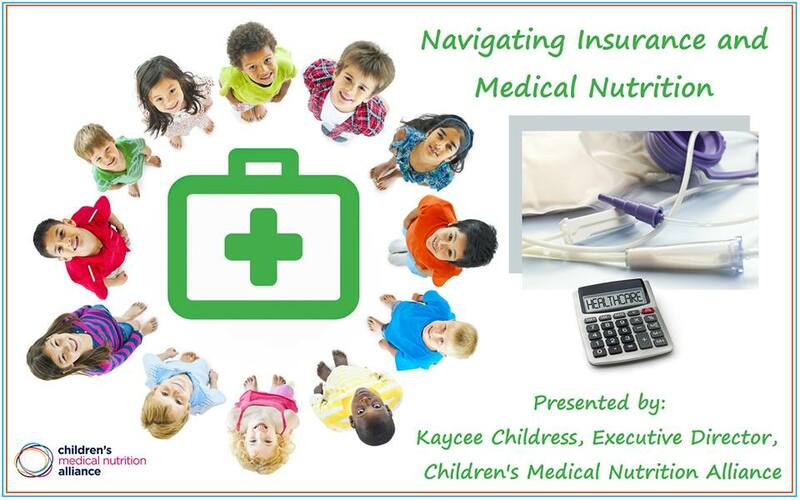 Before he turned 3yrs, a feeding tube was discussed by his medical team for months as a means to help him thrive, and despite not currently having a safe formula to put in the tube, it was hoped that it could provide him with some consistency to escape his cycles he was trapped in due to his allergies and limited diet. The cycle of: not enough nutrition, trialing a food in hopes of finding nutrition, inflammation causing colitis, pain from the reaction; and malabsoprtion leading to anemia, low blood sugar and acidosis, vitamin deficiencies, and weight loss. 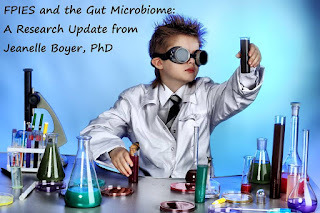 Keeping him further trapped in the cycle was not enough nutrition to make up for the malabsorption resulting in weight loss and further anemia, vitamin deficiency, and other unknown internal disruptions to his body. And repeat with each food trial, each failed food, each accidental exposure or ingestion. A feeding tube should have been an easy decision. But, would it really help him? We knew if it would not help his allergic condition (FPIES) but they assured us they were confident it would help him, somehow. The final decision was left to us. 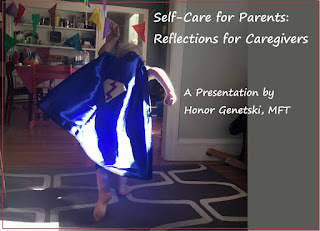 We decided to proceed forward, a large part of the decision now was because he was currently on TPN (Total Parental Nutrition) via an IV line in his chest. 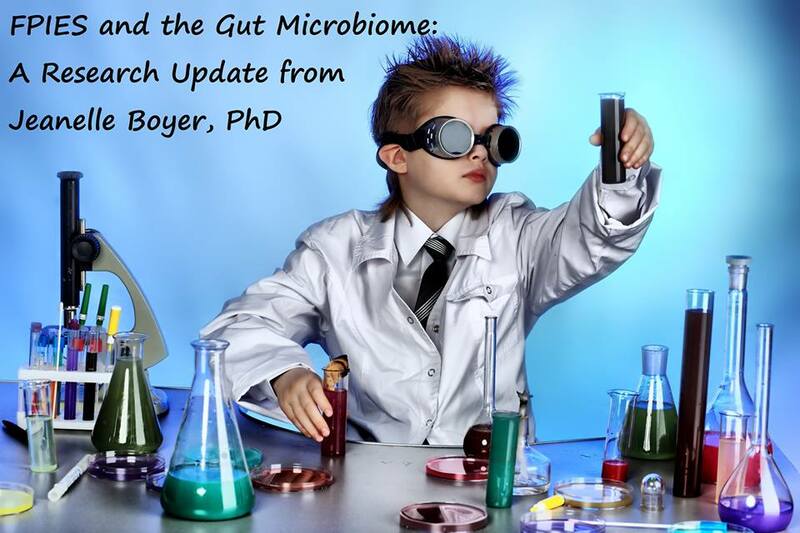 Trapped in that viscious cycle was a little boy who still had to enjoy eating and he was losing that battle, he had begun to refuse foods that provided nutrients he vitally needed; combined with villi damage from food trials left him needing TPN. But, after 8 mo. on TPN and before committing him to a port for continued and long-term TPN, his medical team wanted to trial one more formula and we would do this through an NG Tube which would be his first tests of how his body would handle enteral nutrition. We always remain hopeful that his body will accept the nutrition it needs but after a few weeks on this formula it became clear that even though he was not having a typical acute FPIES reaction to the formula; his body was not accepting it (initially by his outward demeanor, pallor, and sensory flares and then later confirmed by inflammatory markers in his blood and stool). We still don't full undestand this reaction to the formula but by this time, we had already committed to the G-tube and moved away from TPN. What would we do now? Had we made the wrong decision? It was a difficult time, our little boy was hurting and he needed nutrition. We decided to begin moving forward with a blended diet of his safe foods to start, with the hopes that his nourished body would begin to heal itself and, with nourishment we could slow down his food trials to the pace his body needed for recovery between trials and we could, hopefully, slowly, add more foods as we expected to do when he was first diagnosed. He fell into a viscous cycle and now his tube could break him out of this! We had hope! It has been a slow process but we have been able to add a few new foods -- to his diet and his blenderized feeds - every year since then, filling in his nutrition. And, along the way, he thrived. Having a G-tube with safe nutrition allowed us to finally not have to worry as much about his daily caloric intakes, how we would coax him to eat enough, doing ‘dream feeds’, staying home to prepare his foods safely and fresh. And it allowed us so much more. For the first time in years, we were able to keep his blood sugars stable, he started to sleep through the night – not waking up hungry, and he gained weight and, in time, it helped with his severe anemia. 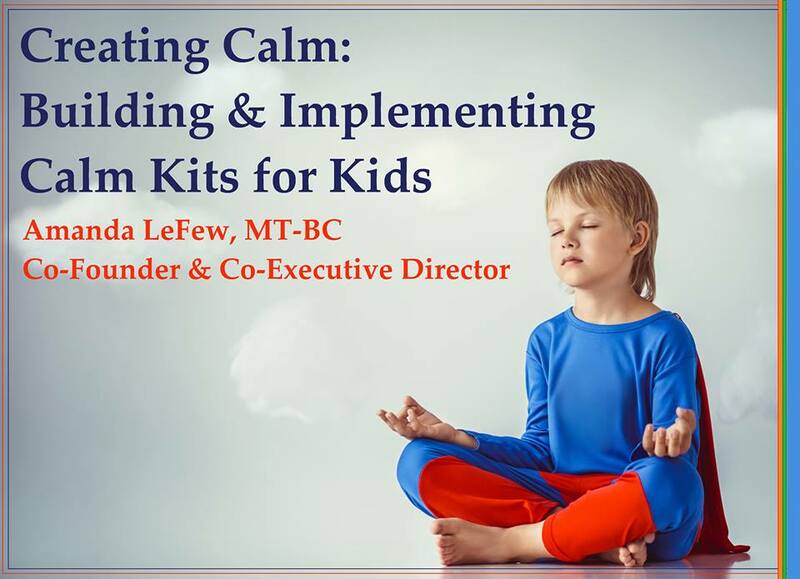 We relaxed around meal times, allowing him to eat his safe foods for pleasure. We relaxed our schedule at home, not having to plan the day around when, where and how he would consume his few safe foods. This allowed us to do more things outside of the home and expose him to more of life and less of hospitals. He has truly thrived. We are truly grateful for this hardest decision. 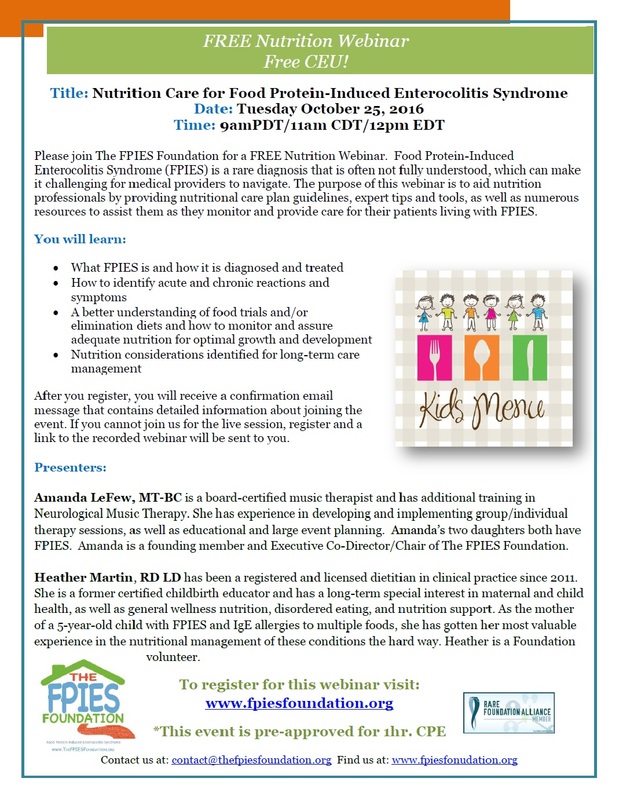 This is very near and dear to my heart, nutrition in FPIES. The FPIES Foundation is doing a webinar on October 25, 2016 for Nutrition Professionals. 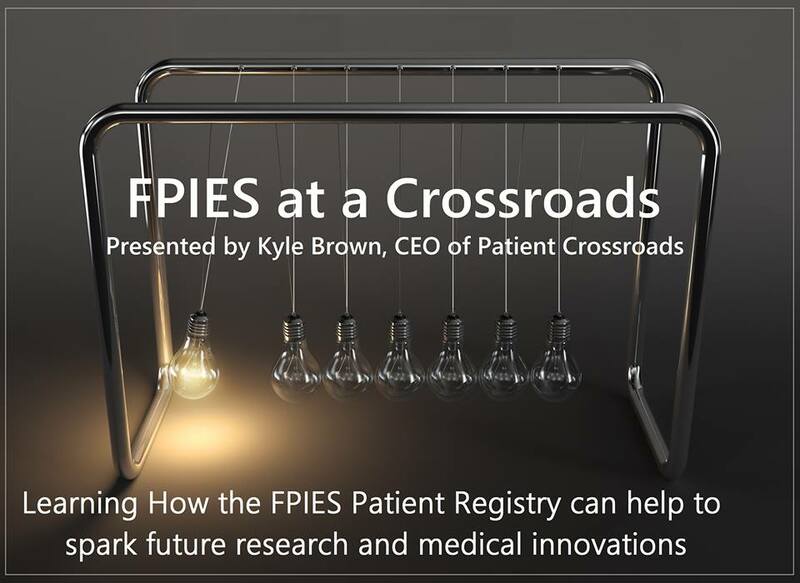 To learn more and register, go here. 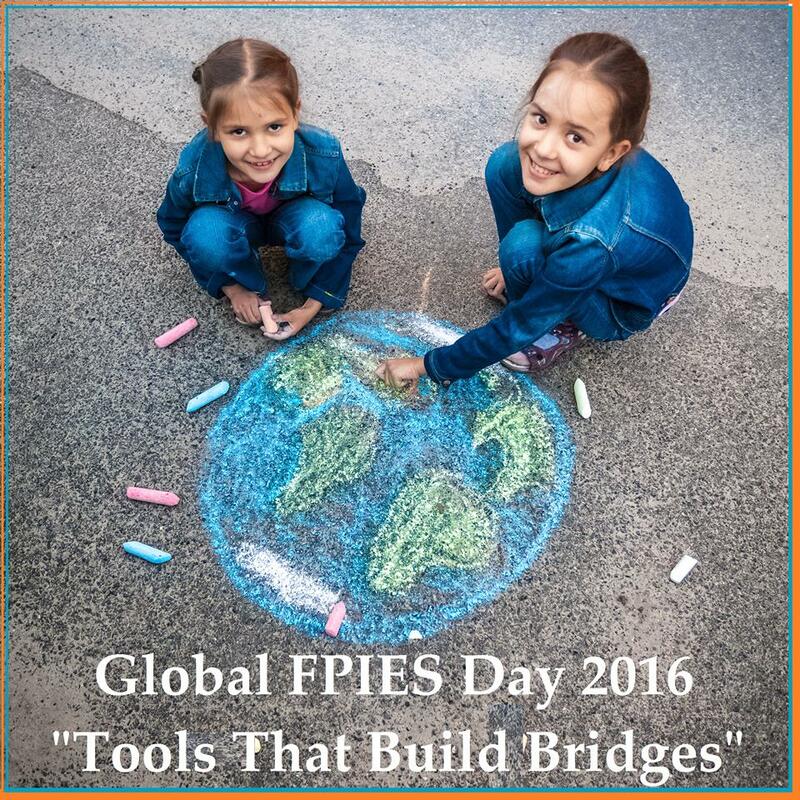 Honoring Global FPIES Day 2016! 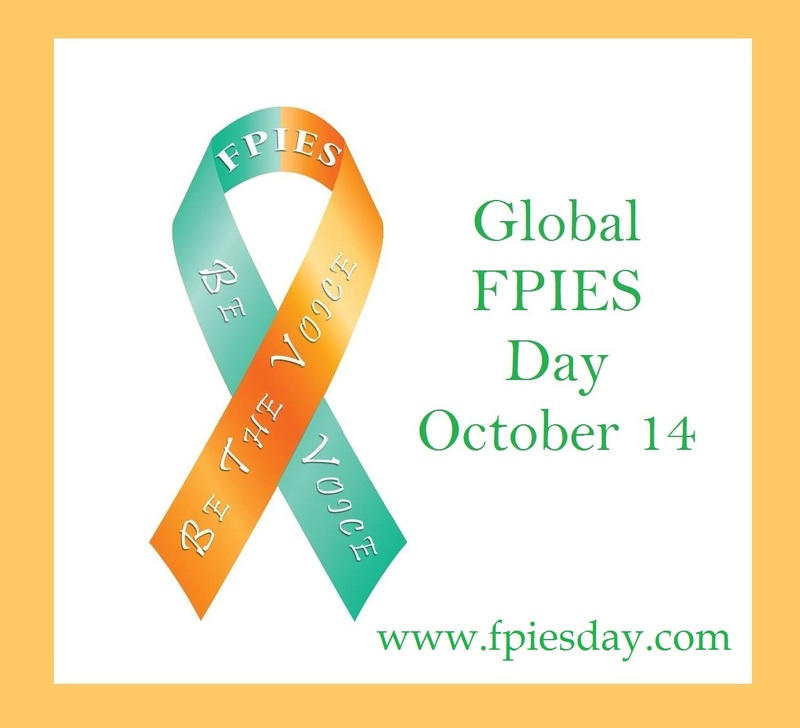 Global FPIES Day happens on October 14th. Visit www.fpiesday.com for more information and to watch these video's on Global FPIES Day! Little man and I are even in one (see Making Seed Milk)! "See" you there! 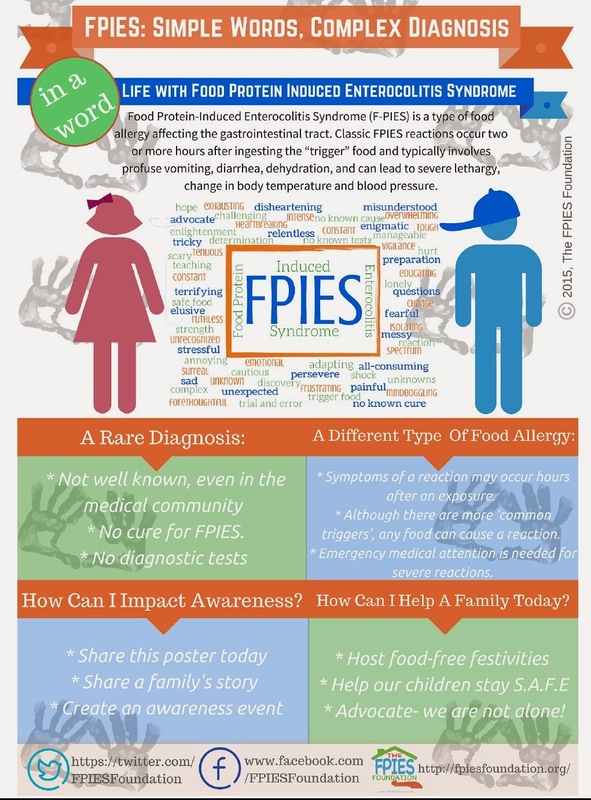 Raising Awareness during Food Allergy Awareness Week! In honor of Food Allergy Awareness week this year, I contacted our local news station, after seeing that the same network had done a short story on our friends in Massachusetts, I inquired if they were interested in hearing more about living with this rare food allergy called FPIES. They were more than happy to help us raise awareness and provided a nice short piece, spotlighting Little Man. You can view it here: Rochester boy suffering from rare food allergy helps spread the word. Little Man has had a feeding tube for over 3 years now, first starting with TPN (IV nutrition via a central PICC line), then an NGT tube followed by his surgery for a G-tube. The G-tube has normalized his life, living with several food allergies that limits his diet. The G-tube allows us to provide his safe foods, blenderized, for his daily nutritional needs. He is strong, growing, and thriving. I wish I could have told myself 3years ago how much the G-tube would change his life. 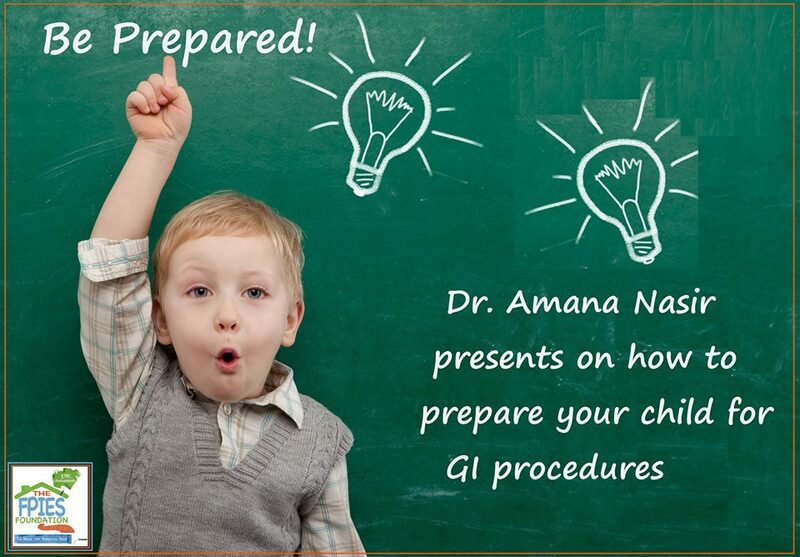 But, the G-tube itself is only part of the reason of the success he has experienced because of the G-tube. What goes in the tube is the other part. 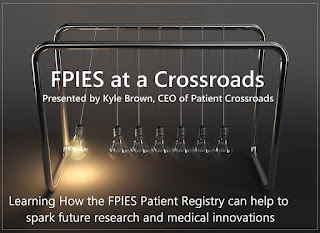 He has so many allergies, finding him a safe, nutritionally complete, diet was a daunting challenge of managing his FPIES. At 5 years old, his diet remains limited but his life isn't. That is because of the freedoms allowed from his G-tube. For Little Man, he thrives because we are able to do bolus feeds of his safe blenderized foods throughout the day. We can't use gravity feed or the pump because of the thicker consistency of his feeds, but we have learned the best ways to provide his blended foods through his tube. 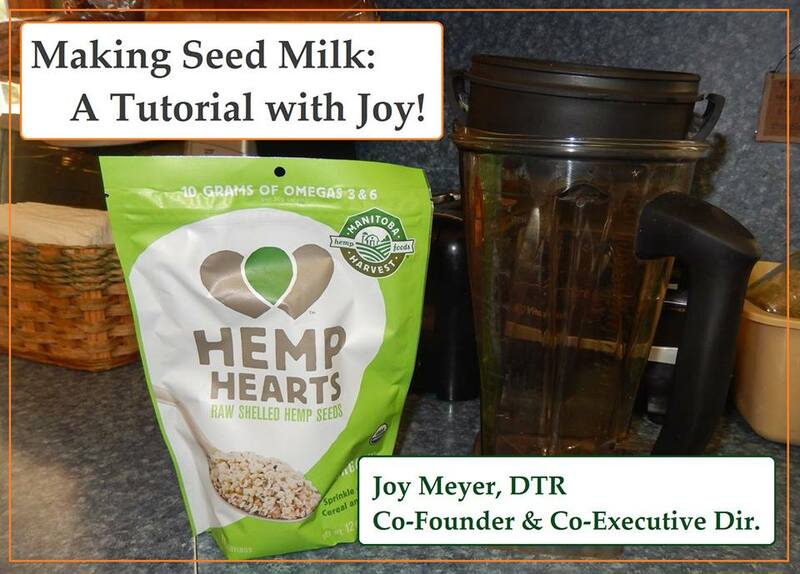 I thought, in honor of Feeding Tube Awareness Week 2015, I would share some of the tips and tricks we have learned to making his bolus/blended feeds more successful, convenient, and less messy! First, this is how we dry out his tube- we rinse/wash it out after every feed. We only get 4 of these a month from insurance, 1 per week, so we must keep reusing the same one as long as possible. I wish I could take credit for this ingenious idea but I got it by following another great resource Mic-key's on the Go when they posted about it one day. Be sure to follow their page- they post some great things! Next is this kitchen appliance I couldn't live without! We were fortunate enough that my sister donated her Christmas bonus to Little Man's needs one year -- this was needed so we purchased it, even before we knew he would need it for a blenderized diet for his G-tube. These two pictures show our storage methods. The top picture is the every day needs of syringes- kept out on the counter, ready to be used for the bolus feeds. We wash them as many times as we can before the rubber tips wear down and are too tight to be used (wish they would last longer!) The bottom picture above is the shelf in the pantry- handy in the pantry, for quick restock of his supplies, including his tubes/extension sets. Next up, mason jars. Mason jars work excellent for storing feeds- I can keep extra feeds in the freezer for back up and thaw easily in the jar (in the fridge of course). I label the feeds with the date, for food safety. If it goes into the freezer, I also will mark what is in the jar but these jars are just ready for the fridge. This is Little Man's current mix of purred pork roast, peaches, and goats milk. Next, I would like to share a bag I purchased. I purchased this from a fellow FPIES mommy via a Thirty-One Sale she was having. I had actually saw a post for another bag and how easily they fit the same mason jars we use for his blended feeds so I ordered that bag and got this bag half price -- and found this bag to be even better for holding his supplies -- and keeping them at a perfect temperature! In the pocket of the bag, I keep some supplies handy - some wet wipes (because blended feeds can get messy), an extra tube (because tubes clog! ), a syringe, bottles of fresh/safe water. This is what the inside of the bag looks like- an ice pack (not included with the Thirty-One bag but purchased separately) designed to hold soda cans, neatly holds our 6oz. mason jars with feeds in place in the bag; while the Thirty-one bag holds up to the frequent uses, washes clean for spills and keeps foods at the right temperature. (disclaimer: I am in no way involved with Thirty-One sales and am just a happy customer!). This is a trick my husband discovered, if you wet the rubber end of the syringe before inserting it back into the tube, it slides in easier (for these repeated uses when the rubber end starts to wear down and make the syringe tight). A final photo tip is another one my husband discovered - a clogged tube that will not push through the dispensing end of the tube can be sucked out through the button end with a syringe! This has saved us from having to throw away countless tubes because of a stubborn clog! 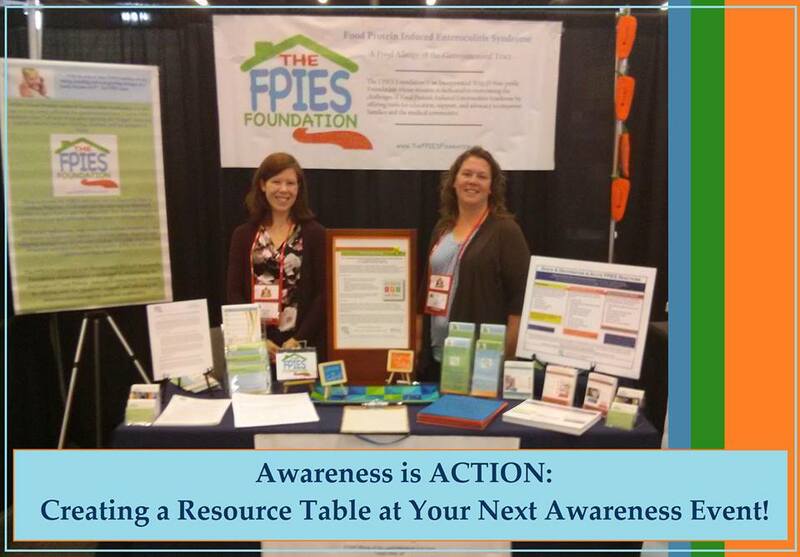 To learn more about Feeding Tubes, be sure to visit Feeding Tube Awareness Foundation!